Healthy Discoveries Are Waiting…Let’s Go! 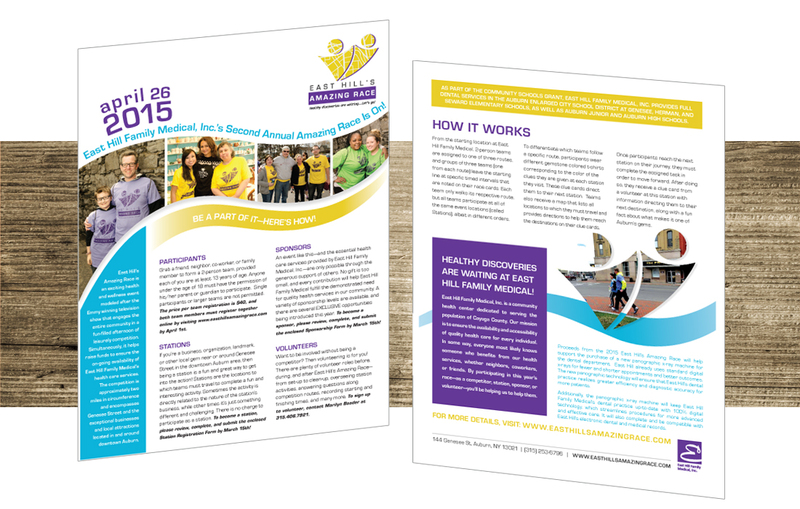 For two consecutive years, East Hill Family Medical entrusted the conceptualization and implementation of its signature annual fundraising event: East Hill’s Amazing Race. Crème della Crème provided strategic event planning, design and writing services (brochures, press releases, activity materials), and public relations support. This enabled East Hill Family Medical to establish East Hill’s Amazing Race as a positive and attractive event for participants, sponsors, and supporters. To ensure the seamless completion of any/all tasks associated with this event, Crème della Crème identified and managed the writing, design, and public relations activities related to the event, and guided the production and distribution of event materials.